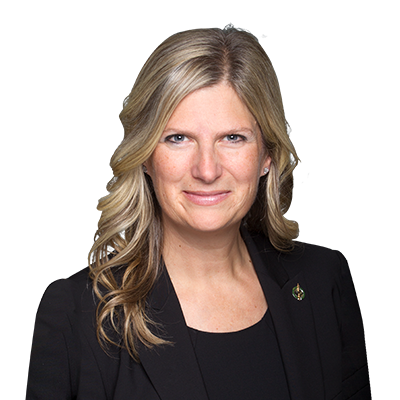 Leona Alleslev is the Member of Parliament (MP) for Aurora—Oak Ridges—Richmond Hill. Leona is a former Canadian Air Force Officer, Senior Manager, and entrepreneur. After being elected in 2015, Leona was appointed as Parliamentary Secretary to the Minister of Public Services and Procurement. Leona later served on the National Defence Committee and the Citizenship and Immigration Committee. Leona is currently a member on the Foreign Affairs and International Development Committee and serves as the Shadow Cabinet Minister for Global Security, as well as a member of the Canadian NATO Parliamentary Association. Prior to serving as your MP, Leona held leadership positions in the Department of National Defence, as well as senior managerial roles with IBM Canada and Bombardier Aerospace. She served on the Aerospace Industry Association of Canada, the Ontario Aerospace Council and the Women in Aerospace Association joint government/industry change initiatives. Leona has also owned and operated two small businesses; an eco-tourism business in Temagami, and a custom closet and ‎home organization company in Aurora. Leona earned a B.A. (Honours) in History and Political Science from the Royal Military College of Canada in Kingston and received her Queen’s Commission to serve as an Air Force Logistic Officer. She has lived all across Canada but Leona now calls Oak Ridges her home, where she has lived for the past 12 years with her husband Ted, and their two children Christopher and Hillary.